While PRP has become a popular procedure for skin rejuvenation, acne scars, stretch marks and antiaging; the procedure of procuring PRP is complicated and warrants technical expertise and precise instrumentation. The operator’s expertise and experience is what makes PRP effective with single session in some and completely ineffective even after multiple sessions in others. The client’s skin is first analyzed by Dr. Vrushali and the problem areas are highlighted. Because its an invasive procedure, the timing of the procedure is scheduled such that it doesn’t coincide with a social event. On the day of the procedure, the patient’s blood is taken and processed in the centrifuge machine. At the same time, an anesthetic cream is applied on the patients face for half hour. The centrifuge process is the most important step of procuring the PRP. It involves a 2 spin procedure, accurate extraction of plasma after 1st spin, gentle transfer of PRP in the syringe without platelet damage. This roughly takes half an hour by which the anesthetic cream has done its job. After cleaning and degreasing the skin, the PRP is delivered to the deeper layers of the skin as planned. It can be delivered by microneedling with dermaroller or dermapen or dirent injections or acombination of the above. After the procedure the patient is given a Do’s and Don’t’s list and also post care instructions. The effects of the procedure are generally seen after 2 weeks and last for 1 to 6 months depending on the lifestyle and nutritional & hormonal status of the patient. 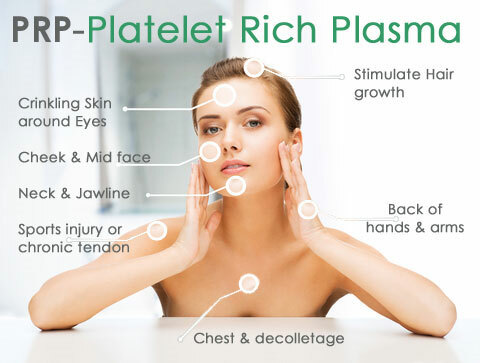 PRP is popular because there is no use of external active ingredients for the skin rejuvenation giving the client a natural, refreshed and rejuvenated look. PRP has shown an effective role in hair regrowth after hair loss, non-healing wounds, rejuvenation of skin, antiaging, open pores, acne scars, traumatic scars, stretch marks, thin under eye skin, etc. In the right hands, PRP can be a powerful armamentarium for a host of skin conditions.